Hays County Courthouse. Image from tripadvisor. SAN MARCOS, Texas -- No principle is more fundamental to the founding of this country than the right of all people to follow their own religious beliefs without interference from or influence by government. Last summer, the United States Court of Appeals for the 4th Circuit issued an opinion in Joyner v. The Forsyth County Board of Commissioners, which found unconstitutional the largely sectarian prayers given before meetings of the board of county commissioners in Forsyth County, North Carolina. A similar practice has been going on in Hays County, Texas, for about the last eight years, subjecting all Hays County citizens to indoctrination in one primary religion. For the last three years, I have communicated with Hays County officials privately about this constitutional issue. I hoped that my private efforts would end the practice of sectarian prayers before county commissioners meetings, but they have not. 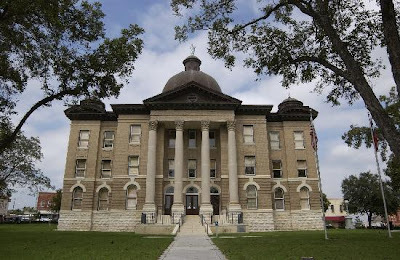 The first three meetings of the Hays County Commissioners Court in 2012 have included prayers from Christian clergy “in the name of Jesus Christ, our Lord and Savior,” “in Jesus’ name,” and “in the name of Jesus Christ.” These invocations are hardly non-sectarian as required by the United States Supreme Court’s First Amendment jurisprudence. That Court has not prohibited all prayers before government meetings -- just the sectarian kind. All citizens who have business before the Hays County Commissioners Court, regardless of their religious beliefs, are compelled to endure proselytizing nearly exclusively by Christians. All who are other than Christian are required to endure Christian religious practice in order to bring their business before the court or participate in their rights of citizenship. Of equal importance, this sectarian practice is a potential affront to county employees who are required to attend some or all meetings. It cannot be expected that employees offended by the practice will feel free to object to attending a public meeting in which they will be subjected to indoctrination in a religion they may not follow or accept. Or perhaps, like me, they believe the government promotion of religious practice is offensive to constitutional principles. My 2009 letter to the court made other points, as well: It is not necessary to pray on taxpayers’ time. Members of government bodies are free to pray privately or to worship on their own time in their own way. When government bodies lend their power and prestige to religion, this amounts to a governmental endorsement that excludes the 14% of the population that is nonreligious (Religious Identification Survey 2001). This practice inevitably turns minorities, including atheists, Jews, Muslims, Hindus, Buddhists, Wiccans, Humanists, and others into second-class citizens. Even when prayers are nondenominational or nonsectarian, there is no conceivable way for a government body to conduct prayers that will not inevitably exclude, divide, and embarrass various taxpayers and constituents. Of course, it is not necessary for invocations to be in the form of prayers. They can be solemn requests on behalf of the citizens to their public officials to follow the principles embodied in our founding documents in their decision-making, rather than prayers for help from the deity of one’s choice. It should be sufficient that public officials make decisions on the basis of equality, equity, fairness, justice, and the public good, rather than on an individual’s religious beliefs. The practice of having sectarian prayers before government meetings is wholly unnecessary to the functioning of county government. I met with the county’s attorney in 2009 to discuss this sectarian prayer problem. He agreed that the Supreme Court has been clear in prohibiting sectarian prayers to open government meetings. Last August, I met with County Judge Bert Cobb to discuss the matter. He assured me that it was a matter that greatly concerned him and he would work to find a way to eliminate sectarian prayers from the invocations at Hays County Commissioners Court meetings. I was asked for and provided a nonsectarian invocation appropriate for opening government meetings. When government meetings are opened regularly with Christian prayer, it sends the unmistakable message that non-Christians are second-class citizens in their own community. That’s unconstitutional, and it’s just plain wrong. All Americans ought to feel welcome at governmental meetings. The Constitution clearly forbids government to play favorites when it comes to religion. Faith is as deeply important as it is deeply personal, and the government should not appear to suggest that some faiths have it wrong and others got it right." ...prayer in governmental settings carries risks. The proximity of prayer to official government business can create an environment in which the government prefers -- or appears to prefer -- particular sects or creeds at the expense of others. Such preferences violate "[t]he clearest command of the Establishment Clause": that "one religious denomination cannot be officially preferred over another." (citing the 1982 case, Larson v. Valente, 456 U.S. 228, 244). After all, "[w]hatever else the Establishment Clause may mean . . . it certainly means at the very least that government may not demonstrate a preference for one particular sect or creed." (citing the 1989 case, County of Allegheny v. ACLU, 492 U.S. 573, at 605). More broadly, while legislative prayer has the capacity to solemnize the weighty task of governance and encourage ecumenism among its participants, it also has the potential to generate sectarian strife. Such conflict rends communities and does violence to the pluralistic and inclusive values that are a defining feature of American public life. ...legislative prayer must strive to be nondenominational so long as that is reasonably possible -- it should send a signal of welcome rather than exclusion. It should not reject the tenets of other faiths in favor of just one. Infrequent references to specific deities, standing alone, do not suffice to make out a constitutional case. But legislative prayers that go further -- prayers in a particular venue that repeatedly suggest the government has put its weight behind a particular faith -- transgress the boundaries of the Establishment Clause. To... Jewish, Muslim, Bahá’i, Hindu, or Buddhist citizens[,] a request to recognize the supremacy of Jesus Christ and to participate in a civic function sanctified in his name is a wrenching burden. Other groups that supported the position taken by the original plaintiffs in the 4th circuit include the Baptist Joint Committee for Religious Liberty, the Anti-Defamation League, the Blue Mountain Lotus Society, the Guru Gobind Singh Foundation, the Hindu American Foundation, and the Sikh Council on Religion and Education. ...not discourage sectarian prayer will inevitably favor the majoritarian faith in the community at the expense of religious minorities living therein. This effect creates real burdens on citizens -- particularly those who attend meetings only sporadically -- for they will have to listen to someone professing religious beliefs that they do not themselves hold as a condition of attendance and participation. Public institutions throughout this country manage to regularly commence proceedings with invocations that provide all the salutary benefits of legislative prayer without the divisive drawbacks of sectarianism.... And religious leaders throughout this country have offered moving prayers on multitudinous occasions that have managed not to hurt the adherents of different faiths. In the end, the constitutional standard asks of the County no more than what numerous public and governmental entities already meet. ...resulted in sectarian invocations meeting after meeting that advanced Christianity and that made at least two citizens feel uncomfortable, unwelcome, and unwilling to participate in the public affairs of Forsyth County. To be sure, citizens in a robust democracy should expect to hear all manner of things that they do not like. But the First Amendment teaches that religious faith stands on a different footing from other forms of speech and observance. Because religious belief is so intimate and so central to our being, government advancement and effective endorsement of one faith carries a particular sting for citizens who hold devoutly to another. This is precisely the opposite of what legislative invocations should bring about. In other words, whatever the Board’s intentions, its policy, as implemented, has led to exactly the kind of "divisiveness the Establishment Clause seeks rightly to avoid." George Washington once observed that "[r]eligious controversies are always productive of more acrimony and irreconcilable hatreds than those which spring from any other cause.’"... As our nation becomes more diverse, so also will our faiths. To plant sectarian prayers at the heart of local government is a prescription for religious discord. In churches, homes, and private settings beyond number, citizens practice diverse faiths that lift and nurture both personal and civic life. But in their public pursuits, Americans respect the manifold beliefs of fellow citizens by abjuring sectarianism and embracing more inclusive themes. That the Board and religious leaders in Forsyth County hold steadfast to their faith is certainly no cause for condemnation. But where prayer in public fora is concerned, the deep beliefs of the speaker afford only more reason to respect the profound convictions of the listener. Free religious exercise posits broad religious tolerance. The policy here, as implemented, upsets the careful balance the First Amendment seeks to bring about. For nearly three years I have been fooled by political cleverness into thinking that the matter of sectarian prayers at Hays County Commissioners Court meetings was being dealt with forthrightly and in keeping with current jurisprudence. I can no longer live with that delusion. The new year has brought us ample evidence that government officials are pursuing a sectarian agenda in Hays County. For that, they should be ashamed and should be held accountable. IDEAS / Bill Meacham : Is Science a Religion?